The British Transport Police has released images of trespassers on the East Coast Main Line, taken during one of 60103 Flying Scotsman’s trips on the railway. The trespassers were photographed at a number of locations from a Network Rail helicopter, while 60103 was travelling between Newcastle and York on May 14. The BTP aims to catch those who were trespassing on the railway trying to glimpse the National Railway Museum’s recently returned A3. 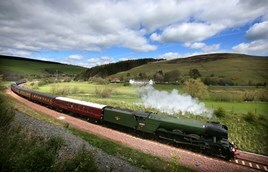 In a statement, the BTP said that despite repeated warnings about the dangers, a number of Flying Scotsman “fans” ignored BTP and other rail industry pleas to stay on the right side of the fence, and trespassed onto the tracks. On February 25 the locomotive’s return to the main line was marred by trespass, with almost £60,000 in delay minutes attributed to trespassers (RAIL 796). Since then, to try and stem the number of incidents, tour promoters and Network Rail no longer release the times that the A3 is travelling, yet linesiders are still risking their lives to see the locomotive. A charter in the Midlands on June 4 was delayed due to trespassing. If you recognise any of the people, call 0800 405040 or text 61016, quoting reference 314 of 2/6 and the photo number. For more on this story, see RAIL 803 on sale June 22 2016. I think the time has come when the NRM and operators must not inform the local radio stations or papers. The run up the MML last weekend being a case in point.... live link ups with the train on BBC Radio Northampton. Papers giving out times & places to spot from..... one location has 1/4 mile of parked cars on the side of the road causing chaos. This run needs to be compared with the Tornado run on the ECML at the same time.... which went through the problem areas for Flying Scotsman back in Feb. I can't understand the stupidity. I've seen her ((Are trains she? ), three times since the return. Once, I got up early and saw the engine being dragged backwards into Paddington from a bridge, where I was the only person, other than a couple of walkers. I then saw the special to Salisbury come out! I also saw the engine at Victoria by chance, as she was sitting there on another special. t then happened that my train out of Victoria was in the next platform. Luckily I was camera-equipped but Southeastern hadn't cleaned the windows of my train. It's becoming a problem with enthusiasts and flying Scotsman fans that they risk not just their lives but to everybody's lives on the railways and not knowing that all railway lines if it's electrified with DC 750v Live 3rd Rail or Live 4th Rail on the London Underground network or AC 25,000v (25kv) Live Overhead Wires or Non-electrified railway lines that Diesel Multiple Unit trains, Class 43 HST's, other Diesel Locomotives and Diesel Freight locomotives use those lines are truly very dangerous and also trains can travel between 60-100mph and on some railway lines such as the GWML, WCML and ECML. Those railway lines have a maximum speed of between 110-125mph. So yes any railway lines in the UK, Europe and Worldwide are very dangerous no matter if it's trains travelling at high speed or if the railway lines are electrified with live 3rd rail or live overhead wires above the railway tracks it's still very dangerous. The solution is common sense, of course. Arrest them before the Locmotive comes into sight; detain them in a bus, out of site of the line, then release them with a caution once it's gone - repeat offenders would be charged appropriately. Deprive them of their photo-op, and they'll learn. The solution is common sense, of course. Arrest them before the Locomotive comes into sight; detain them in a bus, out of site of the line, then release them with a caution once it's gone - repeat offenders would be charged appropriately. Deprive them of their photo-op, and they'll learn.